Ovi (formerly Paddy) is doing great! He is eating, drinking and sleeping well. He loves his flyer toys: I think we have been through 3 already because he likes to play so much and he carries them around everywhere! The most mischievous thing he has done so far is a little pole climbing in our basement! 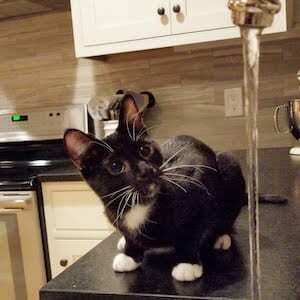 Also, he has a weird obsession with water (as you can see!). Overall he has been a great fit and we cant wait for the years ahead! « Previous Post: Roxy just wants belly rubs!